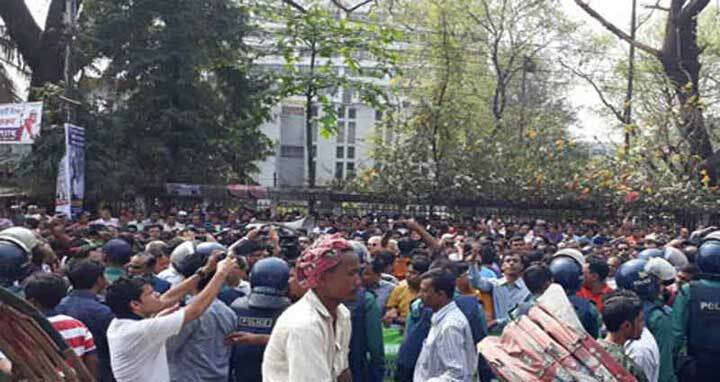 Dhaka, 6 Mar, Abnews: Leaders and activists of BNP formed a human chain in front of the National Press Club demanding release of the party’s Chairperson Khaleda Zia. They formed the human chain from 11.00am to 12.00pm on Tuesday. BNP Secretary General Mirza Fakhrul Islam Alamgir, Standing Committee Member Khandaker Mosharraf Hossain, Barrister Moudud Ahmed, Mirza Abbas and Nazrul Islam Khan, Vice Chairman Barkatullah Bulu, Abdul Awal Mintoo, AZM Zahid Hasan, Chairperson's Advisor Joynal Abedin Faruk, Joint Secretary General Khairul Kabir Khokan, 20-party leaders Syed Muhammad Ibrahim, Dr. Fariduzzaman Farhad and Mostafizur Rahman Iran were also present. The party is also set to observe sit-in programmes across the country on Thursday.